It finally happened for Major League Soccer. Not only did the squad squad with the most designated players win the MLS Cup, the three most famous players on the pitch combined to score the game’s only goal. The Galaxy’s 1-0 victory over the Dynamo wasn’t exactly a master-class performance. But egregious misses from an LA role player were redeemed by both an outstanding defensive performance and three moments of brilliance from their three superstars. Bruce Arena and Dominic Kinnear’s personnel and formation choices were as predicted. 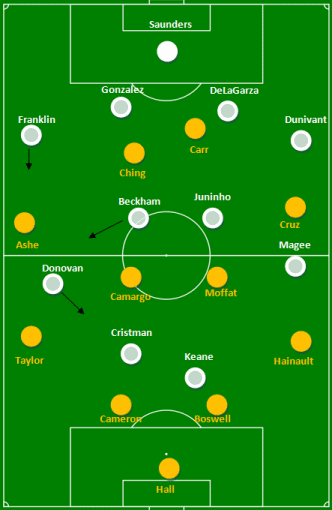 Donovan and Beckham's movement stood out in otherwise staid 4-4-2's. Landon Donovan and David Beckham’s movement was the main source of distinction between the two 4-4-2′s. In the early going, Donovan actually played even more centrally than we thought he would. When LA had possession, their shape wasn’t too dissimilar from the 4-3-1-2 Jurgen Klinsmann used against Slovenia. It was these shifts from the Galaxy’s most famous players that would create one of their best scoring opportunities. In the 27th, Donovan was narrower than Beckham when the Galaxy earned a corner. Striker Adam Cristman missed the target on Beckham’s ensuing cross, wasting the fine build-up play. Fifteen minutes earlier, Cristman produced an even more egregious miss. On another Beckham corner, he failed to find the target with his unmarked header. While Cristman was again the culprit on a disappointing miss, the movement of Beckham and Donovan didn’t create this chance. LA's completed passes show how they took advantage of Brad Davis' absence - and Sean Franklin's fine form - by targeting Houston's left flank. Rather, it was the interplay of Donovan and right back Sean Franklin that led to the opportunity. Franklin was outstanding in the first half, and, from a tactical standpoint, his early aggression was the match’s biggest surprise. Even with two Houston defenders on the left side – Corey Ashe is normally Houston’s fullback – Bruce Arena determined that the Dynamo were vulnerable on that flank. In the 12th, he and Donovan combined to earn the corner that Cristman powered away from the net. Early success on the right wing sent LA back to that flank again and again. If not for Cristman’s errors, the tactic would have led to an early two-goal lead. Houston’s defending wasn’t all bad, though. They coped with LA’s crosses very well: only two of the Galaxy’s twenty crosses found their mark. And while the Dynamo were playing on the counter, they did a decent job varying their defensive pressure, as they intercepted 5 passes in LA’s half. Still, their awful marking of Cristman should have put them down for the count. In this mash-up of LA's interceptions (blue) and Houston's successful passes, it's easy to see how LA's interceptions made a veritable wall that Houston couldn't seem to break through. LA, on the other hand, defended almost perfectly for the entire the match. Like Houston, the Galaxy picked off 5 passes beyond the midfield line. They regularly pressed higher than Houston, but it wasn’t a swarming, Barcelona-style press. 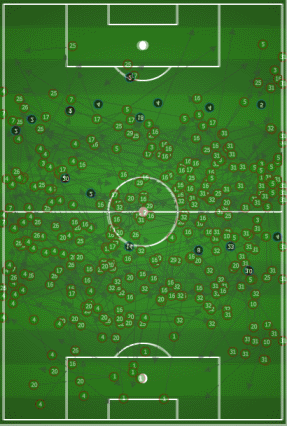 In fact, the Galaxy actually made a more impressive set of interceptions close to their own goal. 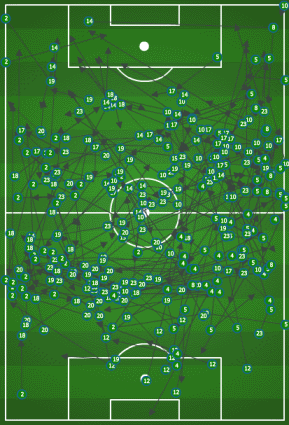 The passes picked off by their defenders made a quite literal ‘backline’ that Houston was rarely able to penetrate. These deep interceptions were the key facet of Houston’s anemic final third attack. They Dynamo only managed one shot in LA’s box, a 66th minute Adam Moffat header (Moffat created the opportunity by picking off a pass intended for Juninho). It would be Houston’s only meaningful shot. Even a late switch to a 3-5-2 was unable to create a hint of an equalizer. The Galaxy, clearly the squad in the ascendancy, were equally unable to consistently put shots on target. This was mostly due to Cristman’s inefficiency – and a terrible offside call against Robbie Keane in the 57th – but none of the Galaxy players were clinical in the final third. Keane created their best scoring chances on the ground, playing 5 balls into the box. But even the Irish international had some puzzling moments near Houston’s goal. Notably, on a 61st minute counter, he failed to either find Donovan in the box or get a shot off himself. Arena was forced to turn to Donovan to find the winning strike. In the 57th, the manager made his lone substitution. He brought on Chris Birchall for Cristman, placing Birchall on the right and moving Donovan behind Keane. It only took 15 minutes for the change to bear fruit. A Franklin chip upfield was flicked on by a Beckham header; Keane beat center back Bobby Boswell and slid the ball to Donovan in the box; and a clever Donovan touch just beat goalkeeper Tally Hall. All three stars were brilliant on the sequence. And MLS finally had its version of Tinkers to Evers to Chance. Gringos, what did you think of the final? Did the breathless build-up for the goal redeem an otherwise pedestrian game? Was that the last time we’ll see Beckham to Keane to Donovan? Excellent chalkboards to highlight facets of the game! I especially like the mashup up of LA interceptions and Houston’s distribution. I thought LA’s defense was excellent, especially Gonzalez. After that performance, I don’t see any justification of Klinsmann calling up Ream over him.